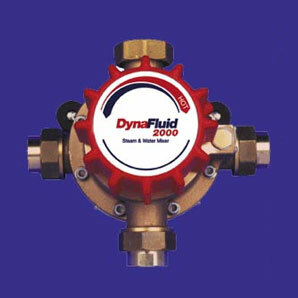 Steam and Water Mixing Valves | De-Mar Inc.
Over 30 years of experience in supplying Dynafluid steam and water mixing valves. Automatically mixes steam and water proportionally, heating it to a selected temperature and providing a ready supply of hot water. The valves are “fail-safe” and cannot pass live steam from the outlet without water flow. 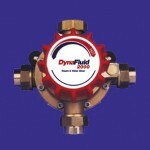 Dynafluid 2000 valve is available in four sizes: ½”, ¾”, 1″ and 1 ½”. Maximum temperature of 200°F and maximum pressure of 150 PSI. Bronze body, chrome plated, and stainless steel body options available. Teflon coated units also available for hard water applications. Sizing charts provided to calculate required hot water temperature rise and gallon per minute produced for each size valve with steam and water on site. Easy to install in any position, simple to maintain and service, operates with uneven steam and water pressure, quiet and economical service, and eliminates need for hot water storage. Experience and knowledge in crossing: Armstrong, Leonard, Miyawak, Spirax Sarco, Strahman, and T & S Brass steam and water mixing valves. 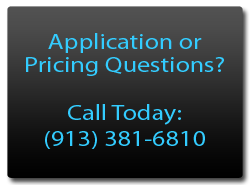 Call today for proper sizing of a valve for your application! 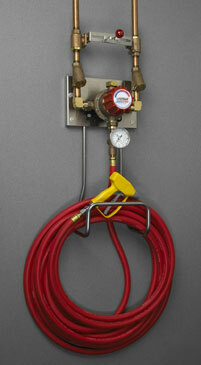 Washdown stations, hoses, water guns, spray nozzles, and water gun lances also available. Washdown stations for clean-up purposes in food processing plants, chemical plants, and pharmaceutical facilities. Also used in food, meat, and dairyfacilities for in plant sanitizing and clean-up. Industrial operations for process cleaning and de-greasing. Complete washdown stations with: mixing valve, hose, hose rack, water gun, thermometer, strainers, and shutoff valve. Different lengths of hose available with red or white color options. Non-marring industrial strength. 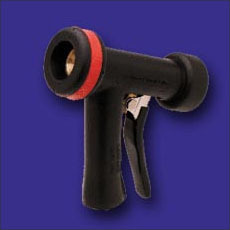 Industrial water guns available with protective rubber cover and various color options. Designed for single- handed use with front trigger or rear trigger. Controllable water pattern, from wide spray to concentrated jet. 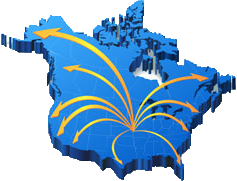 Wide range of orifice sizes for differing flow rate requirements. Hot and cold water mixing valves. Dynafluid 3000 offers a straightforward and economic solution for instant, temperature controlled hot water on demand. Thermostatic valve that can be adjusted from 100°F up to the factory-set maximum of 140°F. In normal operating conditions, the set-point temperature is held to within ±5°F. Bronze body valve with ¾” FNPT connections. Operates over a range of 10 to 90 psi operating pressure and 150 psi static pressure. Valve shuts down within five seconds if cold water supply fails. Straightforward installation requires no gas or electricity. Easy to service without removing from pipework. Hot and cold water mixing valve is factory stock to ship today!